The people who make Fonseca Bin #27 offered up a challenge and I just couldn’t resist. After all, I’ve been using red wine (alternating between a dry red from James River Cellars Winery OR Fonseca Bin #27 Port wine) in my “standard” chocolate chip cookie recipe for the past 15 years or so… why not write the actual directions down and see if people like it, right? I decided to call the recipe: Divine Triple Chocolate Port Wine Cookies. I use chocolate chips in three different sizes and degrees of sweetness, then included Port Wine and a few other “choice” ingredients. I am deviating from my traditional way of using The Force when I cook and have provided actual directions for this recipe. It was tough, but I just had to try it. While my recipe may seem a bit unorthodox, my family and friends seem to find them absolutely divine. I hope you enjoy them as well. Preheat oven to 375 degrees and assemble all ingredients in recipe before you begin. Slowly add 2 1/4 c flour and mix well. Add 1 cup each: mini chocolate chips, regular semi-sweet chocolate chips, and bittersweet chocolate chips. Using a small cookie scoop, place batter, teaspoon by teaspoon, onto a baking stone. Bake cookies at 375 degrees for 11 minutes (you may need to adjust for your own oven temperature). Allow cookies to sit for a minute on the baking stone before removing to a wire rack to cool. I like to keep this cookie dough recipe in my fridge so I can make fresh cookies at a moment’s notice, as my boys’ friends can attest. These are wonderfully divine! If you feel so inclined, please consider voting for my recipe, using this link. I hope you try this recipe and enjoy making it and sharing it with the ones you love… after all, isn’t that why we cook in the first place? 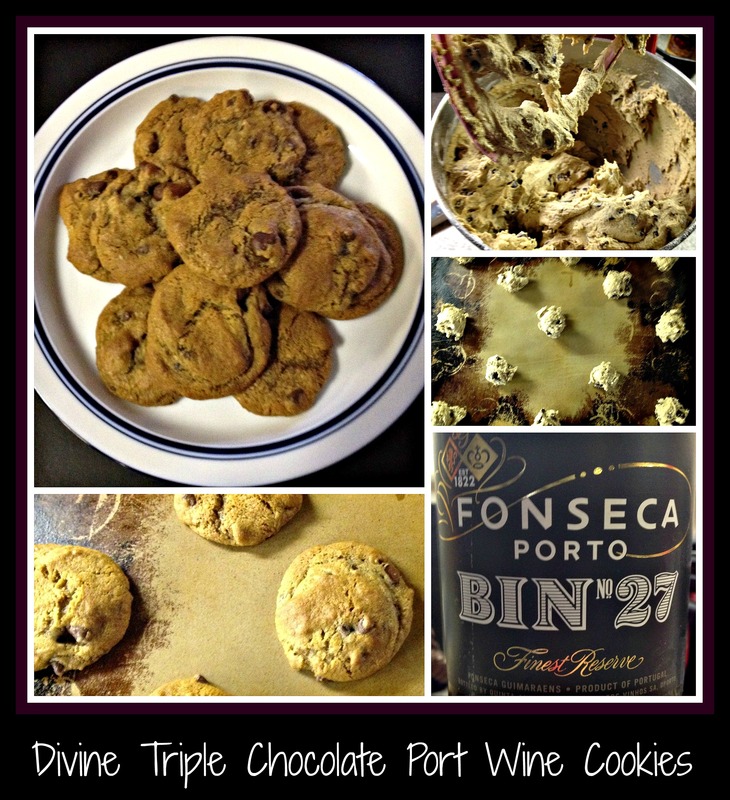 This entry was posted in Cooking, Recipe, Wine and tagged chocolate chip cookies, chocolate chips, cookies, dessert, easy recipe, Fonseca Bin #27, James River Cellars Chambourcin, port wine, red wine. This is my favorite recipe to keep in the fridge to share with friends at a moment’s notice… hope you’ll enjoy it! I can’t wait to try your recipe! I actually just opened a Fonseca Bin 27, so this is perfect timing. I was given some port wine to try which I found too sweet. Decided to bake with it and came across this recipe here. I don’t know if you won the contest or not but you won it here at my house. Thank you for posting.